Part of the legacy of the 2012 Olympics is the mountain-bike course at Hadleigh in Essex, including some rather challenging terrain for bikes. Arising from that is the slightly confusingly named Hadleigh 2012 Legacy 10k, confusing only in the sense that one must understand that the 2012 doesn’t refer to the year of the event, a 10k run around the course. I did this last year, and said at the time it was the hardest 10k I’ve done, and 12 months later I still agree. Somehow I was persuaded to come back for a second go. We’ve had much wetter weather recently, so I expected conditions underfoot to be tougher. They were, but only a little, as despite one’s distorted memories, the large majority of the route is on firm gravel surfaces. But the muddy bits were definitely muddier and I was restricted to an inelegant stumbling, flailing walk on them. 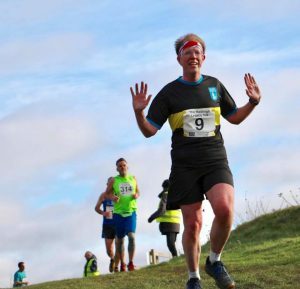 The route is essentially all hill (or is to the eyes and legs of someone who started all his running on the flood plain of the River Lee), with around 300 metres of ascent in its 10km – not much by some standards, but plenty for me. Some of it is very rocky too, and running up it is quite a challenge. There are two tunnels on each of the two laps, and a 270° corner where you loop tightly around above the runners just behind you. There are zig-zags to get up hills which my Strava plot tells me peak at a 41° slope. And there is a grassy section some of which rapidly turns to mud on a sideways slope – interesting! My hope had been to beat last year’s time, but I didn’t manage it, being about 1½ minutes slower – perhaps I set off too fast (though most of the start is downhill), perhaps the extra muddiness took its toll, perhaps it was just that it was windier than last year, or maybe despite the marathon training I’m still not quite at peak fitness yet. 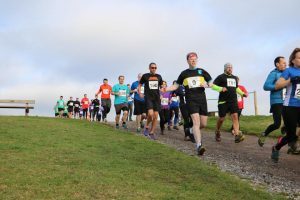 I think there was also a little mental challenge which I didn’t quite overcome – once I decided I definitely wasn’t going to beat last year, I perhaps was too content to walk up some of the hills that I ran up last year, though I note that the winner was almost two minutes slower than last year too, which I take some heart from. By contrast Claire, whose idea it was originally for us to run it, knocked several minutes off her time – well done Claire! She has just crossed the finish here so is showing the agony I’d been showing a bit before, while I’ve had chance to recover. 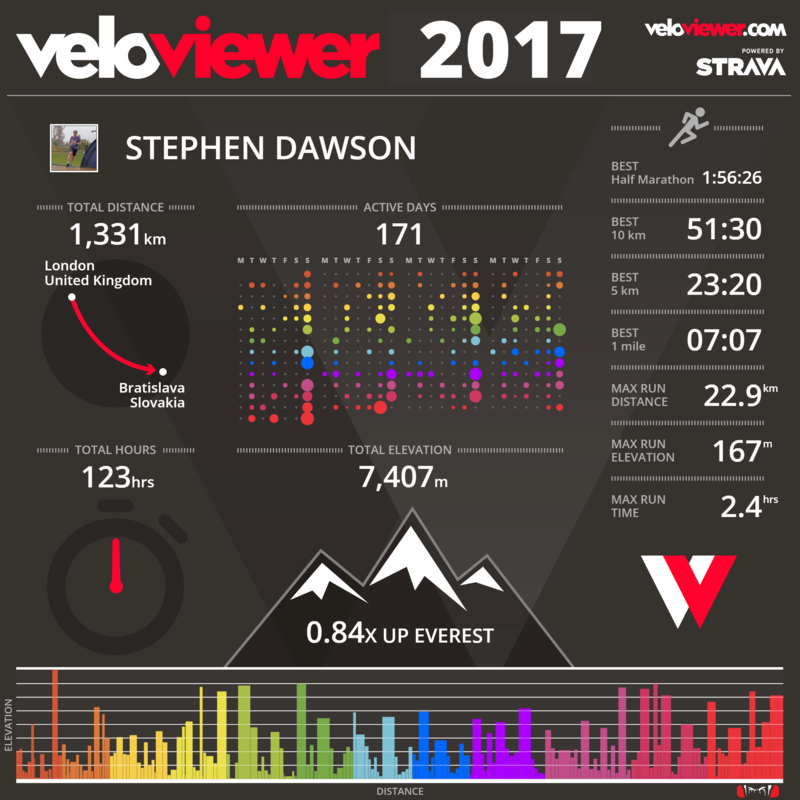 So, how did 2017’s running go? I’m pretty pleased. I gained a place in the London Marathon for April 2018 (I’m looking for sponsorship in aid of Guide Dogs) which added a major new goal, and as a result from May 2017 I’ve run a half-marathon every month: it’s not easy yet, but the distance is not nearly as daunting as it once was. 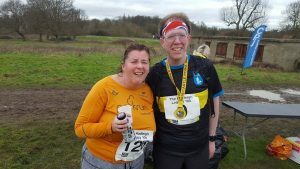 I enjoyed 10 different races: the challenge and variety of Hadleigh Legacy 10k which I’ll be doing again in 2018; Greenwich Park 10k where despite the hills I got a great time; the old familiar ground of the Lee Valley Run Fest 10k; the different challenge of 10 laps of the Lee Valley Velopark for the 10-mile there; the London 10 mile in the glorious scenery of Richmond Park; the delights of the Great Yarmouth half with the thrill of a new PB; my shortest race in the Stowmarket Golden Mile; the new challenges and pleasant scenery of my first trail half in Kings Forest; the flat Great Eastern Run half-marathon in Peterborough where the crowds helped to propel me to another PB; and another different environment in the Snetterton Race Track half-marathon, where I managed to equal my half PB. I set new personal best times at every distance I monitor, from 1 km to half-marathon. I ran 1331 km, the furthest I’ve run in a year, including finishing the year on 31st December with my longest run yet. I met my commitment to go to new places, visiting 512 different map squares, the most in a year (including 394 not been to at all before) – that expanded my red visited squares in Suffolk (the green boundary), as well as taking me to my 53rd different parkrun location.